It’s possible to use the Droid Bionic’s Gallery app to perform some minor photo surgery, such as image cropping. Cropping is one useful thing you can do on your phone. Still, the best tool for image editing is a computer amply equipped with photo-editing software, such as Photoshop or one of its less-expensive alternatives. Open the Gallery app and display the image you want to crop. Press the Menu soft button and choose Edit. Choose the Crop command from the Edit menu. If prompted, touch a face in the image. 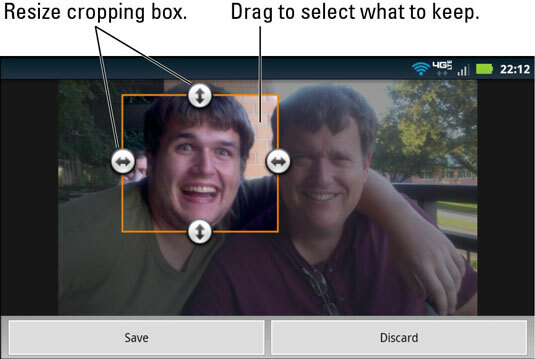 The Droid Bionic automatically recognizes human faces in images. Touch the face you want to keep in your cropped photo. Use the onscreen controls to crop the image. Refer to the figure for help with using the onscreen cropping controls. Touch the Save button to crop the image. The image’s size and content are changed immediately on your phone.